City Councilman David Alvarez and former Assemblyman Nathan Fletcher are in a tight race to decide who will face City Councilman Kevin Faulconer in the February runoff to select San Diego's next mayor. In Tuesday’s special election, Faulconer held a strong lead throughout the night, nearly 20 points ahead of his nearest competition. This guaranteed him a spot in February’s runoff. “Tonight, we have shown what we’re capable of, and I can’t wait to hit the ground running tomorrow,” Faulconer told an enthusiastic crowd of supporters late Tuesday night. The question became, who will face the Republican Faulconer in the runoff? Democrats Alvarez and Fletcher were in a virtual tie for most of the night. When all precincts reported around 1 a.m. Wednesday, Alvarez (25.59%) had inched ahead of Fletcher (24.30%.) There are still about 34,500 mail-in and provisional ballots to be counted, according to the Registrar of Voters website. However, both Alvarez and Fletcher stayed optimistic Tuesday night. “It’s going to be a little bit longer until we can actually declare victory, but I am certain that we will be doing that at the end of tonight,” Alvarez said Tuesday. “We’ve fought every day of this campaign, and we’re going to keep fighting for a few more hours,” Fletcher said. Fletcher plans to meet with members of the local media around noon Wednesday. NBC 7 will cover that event. The special election was held to replace embattled former mayor Bob Filner, who resigned Aug. 30 in the midst of a sexual harassment scandal. Filner was in office for nine months. Voter turnout was higher for this special election than for the past 3 to 4 special elections in the City of San Diego. The election results ended up mirroring the latest polls, which projected a solid first place finish for Faulconer and a battle for second place—and the coveted runoff spot. With just 2,600 or so votes between Fletcher and Alvarez and more than 34,000 provisional ballots to be counted, the second spot is still up for grabs. Alvarez was elected to the Council in 2010 and has the support of labor and the San Diego County Democratic Party. The Barrio Logan native helped negotiate a controversial community planning blue print designed to create a buffer between ship builders and homes. Some community leaders criticized Alvarez for compromising too much. 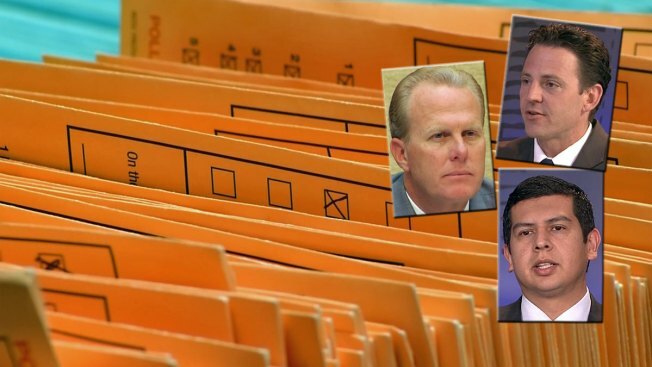 The issue will be one that differentiates Faulconer and Alvarez.. The Republican has campaigned on creating jobs and business in the city. Alvarez canceled his appearance on NBC 7 saying he lost his voice from all the campaigning he has done in the final days of the race.